Cut the broccoli florets from the thick stalks, leaving an inch or two of stalk attached to the florets, or remove florets from bag. Cut the larger pieces through the base of the head with a small knife, pulling the florets apart. You should have about 4 cups of florets. Place the broccoli florets on a sheet pan large enough to hold them in a single layer. Toss the garlic on the broccoli and drizzle with 2 tablespoons olive oil. Sprinkle with the kosher salt and pepper. Roast for 20 to 25 minutes, until crisp-tender and the tips of some of the florets are browned. Meanwhile, put one Tbsp olive oil and the remaining ingredients into a serving bowl. Remove the broccoli from the oven when ready and immediately add it to the serving bowl and toss with the ingredients. Serve hot. This was just wonderful. If you are looking for a way to dress up broccoli and make it interesting without over powering it, this is a great option. Fancy enough for guests but easy enough for any weeknight. This was great! My only problem was that the rest of my meal wasn't done at the same time, so by the time we sat down to eat it was cold. But it is great right out of the oven. So just keep that in mind. I tried this last night and the lemon is really wonderful. YUMMY! Glad you liked it Charlene. Thanks for sharing the review! This dish was delicious, John. 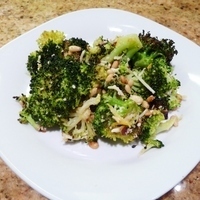 The pine nuts added a complimentary flavor and texture to the broccoli. I've been roasting broccoli for years....and almost the exact recipe. I also came up with a low fat lower sodium version by replacing the olive oil with chicken stock and using braggs amino acids as the salt. Thanks for the review, Christine. I took a look at Braggs and just bought a bottle on Amazon. Will see how it compares to soy sauce. Thanks for sharing! Looks exciting. Will try it! I personally love broccolli. I find ways to create different dishes for this. Thanks! Nothing like roasting veggies to bring out their flavor. I love all the herbs, pine nuts, and lemon. Thanks for the comment, Judee. Hope you enjoy it! i am thinking of trying this recipe tossed with linguine, more cheese and pepper flakes for a meatless meal or a light lunch. I love roasting broccoli - it brings out a whole new flavor. Great recipe! !